(NaturalNews) Constipation is one of the most common medical conditions affecting Americans today. In fact, the American Society of Colon & Rectal Surgeons claims that approximately 80 percent of people will suffer from infrequent bowel movements at some point in their lives. (1) While environmental changes, improper hydration and a lack of exercise often contribute to constipation, the overwhelming cause of chronic instances is poor diet. Indeed, since the advent of processed foods, the average American consumes a mere 12 to 15 grams of fiber per day -- far less than the recommended 25 to 30 grams. While consuming more fiber-rich whole foods is an effective way to treat constipation, there is another type of food that is particularly potent in this regard: mucilaginous foods. These are foods rich in mucilage, a thick, gooey substance that slides down the intestinal tract when consumed and sweeps it of accumulated waste. The three foods listed below are especially high in mucilage, making them a great choice for treating long-term irregularity. 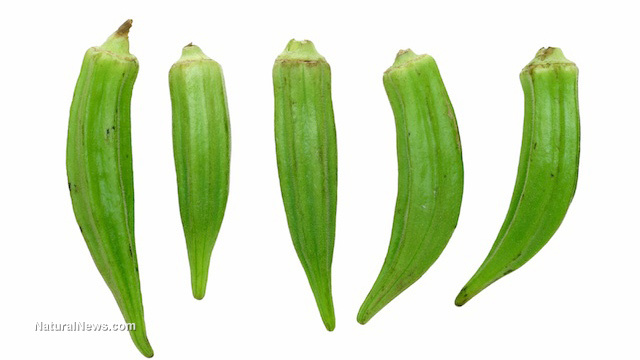 Perhaps the best-known mucilaginous food is okra, a tall, flowering plant cultivated in many warm regions of the world. This plant bears edible green pods which, when cooked, transform into a rather slimy mess -- a testament to their dense concentrations of mucilage. This mucilage is proven to lubricate the intestine as it passes through, soothing inflamed areas, absorbing excess water and toxins, and flushing out the colon. Slippery elm is a species of elm native to eastern North America. As the name suggests, the tree is packed full of mucilage, and its inner bark was used by American settlers for decades to treat gastrointestinal complaints such as indigestion, inflammation and constipation. Chia seeds are the oval-shaped, multicolored seeds of the Central American chia plant. Despite being being dry and hard in their default state, these highly nutritious seeds contain high levels of mucilage. Soaking them in water for at least 30 minutes makes this fact quite evident -- the seeds become coated in a slippery gel and start to resemble frogspawn! Other mucilaginous foods with natural laxative properties include flaxseeds, marshmallow root, aloe vera, cactus, fenugreek, sea vegetables (especially kelp and Irish moss), licorice root and Chinese yams.